No one could get near Sebastian Vettel in qualifying in Singapore today. 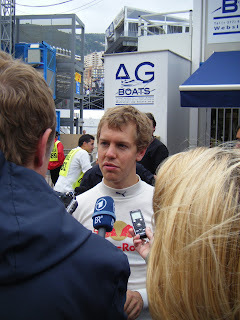 He claimed pole, as is standard, and even by his experience of this season it was comfortable. He was routinely several tenths clear of the next challenger in each of the sessions, and didn't look remotely perturbed at any stage. Singapore is very much his fiefdom it seems. It's Seb's eleventh pole of the season, three short of Nigel Mansell's record for a single campaign set in 1992, and it's hard to see even that record surviving the year. And Red Bull's clean sweep of poles this year continues (it's also their fifteenth in succession in total). It's not clear who or what can stop them on a Saturday in 2011. Seb's advantage over the next guy, team mate Webber completing a Red Bull lock out of the front row, was three and a half tenths of a second in the final breakdown. But that disguises that Seb didn't even feel it necessary to complete his final run - in 'reality' he was even further ahead. Another guy who didn't complete two runs in the final qualifying session was Lewis Hamilton, who curiously parked it after his first attempt (after which he was placed second). It looked initially like he was gambling of saving a set of new tyres for tomorrow's race, but he subsequently indicated that it was down to a technical problem in refuelling the car for his second run. This all resulted in him being bumped down by Webber and Button to start fourth tomorrow, though with the consolation of an extra new set of super-softs compared to his rivals. Therefore, he may make some hay in the race. If he does finish ahead of Webber, Button and Alonso tomorrow it'll help Vettel claim the championship this weekend. Fernando Alonso hustled his car as always (he ended up almost a second quicker than team mate Massa), but never seemed entirely content with his one-lap handling, and he ended up fifth on the grid, at the back of the close pack lining up second to fifth (indeed, Alonso was only a tenth and a half slower than Webber in second). He may yet make good on expectations that he'll be Seb's closest challenger here tomorrow. His longer runs have looked stronger than his qualifying runs (as they have been all season) and their gentler tyre usage may serve them well. But even he'll struggle to overcome Seb's pace advantage. Especially starting from that far back on a track on which overtaking isn't easy. Not running was to a large extent the story of qualifying today: as of the top ten Michael Schumacher and both Force Indias elected not to set a time in the final session, presumably to save tyres for race day. Strategy-wise it makes sense but it can't be deined it looks bad and seriously short changes those watching on (it's also a pity that it took the gloss off a good performance by the Force Indias - both of whom qualified in the top ten for the first time since Canada last year). Surely something has to be done to incentivise qualifying running, particularly in the last session. Perhaps making an extra set of options available for the last five minutes of this session will help, and Pirelli have talked about bringing qualifying-only tyres back, which would also solve the problem. Tomorrow will be a long race, there will be plenty of issues around managing tyres and variations in strategy throughout the field, and no doubt there will be a lot of incidents and safety car periods given the close proximity of things for cars to hit. But even with all this it's difficult to see how Seb can be stopped. He'll aim to lead from the start, escape the DRS window, and manage his tyres and the race from there. Just like he's been doing all season in other words - and this time he has an ample pace advantage in his pocket.